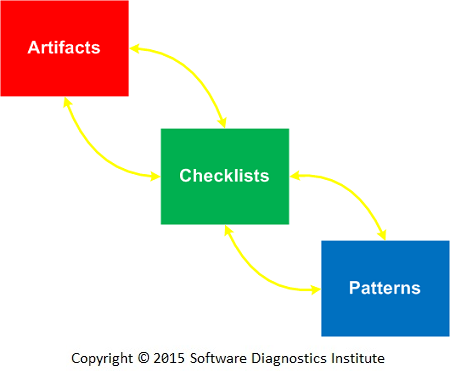 At that time, pattern-oriented software diagnostics was not yet fully developed so the proposed root cause analysis methodology was primarily debugger commands-based for memory analysis (in the form of checklists) and analysis patterns-based for software trace and log analysis where checklists were patterns-based. Pattern sequences (former pattern succession) help in finding root causes. 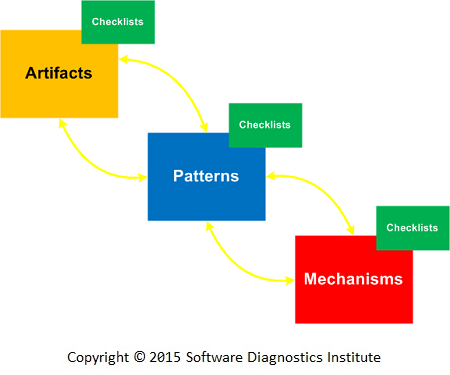 Pattern catalogues as checklists were later introduced for First Time Software Diagnosis methodology. Patterns were also introduced for memory dump and trace collection. 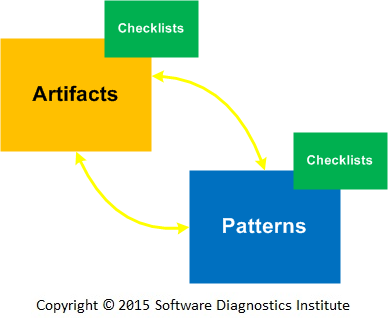 With the development of pattern-oriented software diagnostics, we realized the centrality of patterns and the division of patterns into general and concrete problem patterns and problem analysis patterns. However, the causal nation of root cause analysis is not explicitly mentioned in the process. Many problem patterns can be caused differently, for example, Dynamic Memory Corruption patterns can be caused by buffer overwrites and underwrites, invalid API parameters, double memory releases, and even memory manager defects resulting in similar diagnostic indicators seen in memory snapshots and traces. Therefore, we introduce the notion of Mechanism to describe the possible cause of a diagnostic pattern. Such mechanisms replace pattern sequences as causal analysis tools. Mechanisms can also be organized into catalogues and have checklists. Mechanisms provide software internal links between software construction, post-construction, and deconstruction pattern paradigms. The forthcoming volumes of Memory Dump Analysis Anthology (from volume 9) will now include Software Problem Mechanisms and Pattern-Oriented Root Cause Analysis Case Studies chapters in addition to usual pattern chapters.